Welcome to the final Friday Figures of the regular season. With senior nights abounding around the Big 12, this week we’re showing some love to a few of the league’s most talented and/or under-appreciated old guys. Kenrich Williams is TCU’s do-it-all glue guy. Only eight players in the last 25 years have averaged 13.0 points, 9.0 rebounds and 4.0 assists per game over the course of a season. One of that group is Williams. Several players on the list — Ben Simmons, Evan Turner and Royce White, for example — were future pros. Williams is also one of only three players in that group to attempt more than three three-pointers per game and is the only one to make better than 40.0 percent of them. On the other end, he is a terrific and multi-positional defender who averages nearly two steals per contest. A former junior college player who joined the Horned Frogs for his sophomore season, Williams has developed into one of the most versatile players in the Big 12. Khadeem Lattin is the league’s overlooked defensive anchor. Lattin, a three-year starter for the Sooners, can get lost in the mass of impressive rim-protectors in the Big 12. However, the senior center is perhaps the most influential piece of his team’s defense. Individually, Lattin has the third-highest block rate among qualified players in the conference at 9.5 percent and second highest steal rate (3.3 percent), per KenPom. Both of those translate into a more effective team defense for Oklahoma. The Sooners concede seven points per 100 possessions fewer with Lattin on the floor, per Hoop Lens, as opponents commit significantly more turnovers and shoot just 47.5 percent inside the arc — five points lower than with him on the bench. Obviously Oklahoma’s overall team defense has been a disappointment this season — it ranks outside of the top 100 in adjusted efficiency — but Lattin deserves no blame for those struggles. Instead, he gets a bit of praise. When Oklahoma lost Buddy Hield, Ryan Spangler and Isaiah Cousins after their trip to the 2016 Final Four, the Sooners predictably dropped off. They were better than their 11-20 overall record last year suggested, but you couldn’t fault anyone for tuning them out as it quickly became clear that a return to the postseason wasn’t in the cards. Just one season later, though, Lon Kruger‘s team is right back to putting up explosive numbers with one of the country’s best guards leading the way. To be clear, freshman point guard Trae Young and the former NPOY Hield are vastly different players, even aside from their different track records. Whereas Hield made most of his hay off the ball, Young is a more balanced offensive threat possessing savvy court vision to boot. In the early going, though, Young is showing that he could have a similarly memorable campaign in Norman. Facing legitimate competition for the first time this season, Young balled out at the PK80 event in Portland, averaging 34.7 points per game across three tilts against Arkansas, Portland, and Oregon, while putting up a hyper-efficient 70.8 percent true shooting percentage. The freshman has excelled everywhere on the floor — shooting 38.6 percent from three-point range, 57.1 percent inside the arc, and 89.4 percent at the free throw line. For greater context, his 8.0 fouls drawn per 40 minutes dwarf Frank Mason’s clip of 5.5 per 40 last season, and he’s making his opponents pay at the stripe. Young’s aggression while leading the third-fastest offense in the country occasionally backfires in the form of a bad pass or ill-advised shot, but those miscues haven’t yet been detrimental to the Sooners, nor are they currently keeping him from occupying the top spot in KenPom’s National Player of the Year rankings. This preview is part of RTC’s 2017-18 preseason coverage. 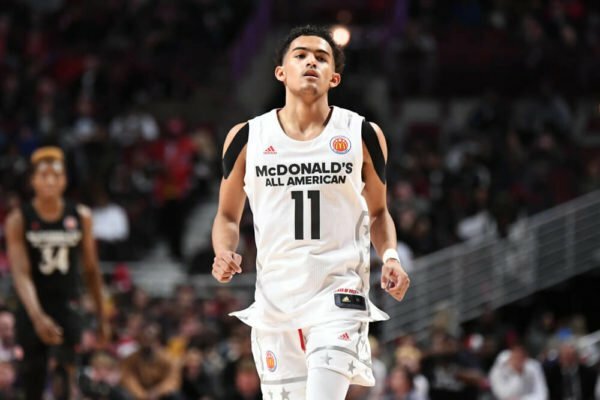 Burning Question: Trae Young will make a difference, but will the Sooner offense be good enough? Everyone knew Oklahoma would regress after losing National Player of the Year Buddy Hield and his terrific supporting cast from the Sooners’ 2016 Final Four run, but you’d still be hard-pressed to find someone who predicted an 11-20 overall campaign. Reprising his role at point guard but expected to do more, senior Jordan Woodard started out strongly before sustaining a leg injury midway through the season, followed by a career-ending ACL injury in February. The team’s defense was plenty good (0.96 PPP allowed), but the offense was far cry from the BuddyBall era, plummeting from 16th nationally to 118th. 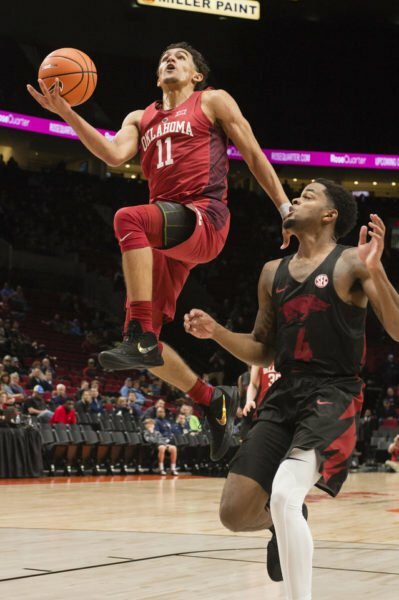 Head coach Lon Kruger landed top-flight point guard Trae Young to replace Woodard, but Kruger will need significant contributions from more than just the precocious freshman to return to the postseason. Young is considered more of a scorer than a facilitator, and the Sooners need offense any way they can get it this season — they were especially woeful on close looks, shooting just 55 percent on attempts at the rim, per hoop-math.com. Young isn’t a burner, but while he lacks the elite quickness of someone like Jawun Evans, his developing frame should allow him to withstand contact and create dump-off opportunities for his teammates. Trae Young gives Oklahoma the point guard it sorely needs, but the backcourt as a unit needs to take a big step forward in 2017-18 (Patrick Gorski/Sportswire). One Sooner who didn’t have any issues finishing down low was 6’10” center Khadeem Lattin. Now a senior, Lattin will be one of the best big men in the Big 12. His defense will continue to be his calling card, but if Young is the real deal on the perimeter, Lattin should also be able to contribute more offensively than he did in his first three seasons. He’ll also have some help down low with the rotation of freshman Brady Manek, a Euro-style stretch four who impressed in the Sooners’ summer trip to New Zealand, and 6’7″ Kristian Doolittle, who averaged 11.2 PPG in Big 12 play as a freshman. Unfortunately for Kruger, Doolittle won’t make his debut until mid-December after being suspended for academic reasons, but it should present Manek with some opportunities to develop and find a place in the rotation. Junior Jamuni McNeace and sophomore Matt Freeman will give Oklahoma additional depth in the post. If college basketball games ended after the first 20 minutes, Oklahoma would be one of seven remaining unbeaten teams in Division I and presumably ranked among the top 10 or 15 teams in the nation. Unfortunately for the Sooners, which currently stand at 6-4 and have led at halftime in all four of their losses this season, there are still two 20-minute halves in college basketball. Unless Lon Kruger‘s team can figure out how to be as successful in the second halves of games as they are in the first, Oklahoma is likely to miss its first NCAA Tournament since 2012. In its four defeats this season to Northern Iowa, Wisconsin, Wichita State and Memphis, all but one of those contests came down to the wire. The excuse of the loss of NPOY Buddy Hield, who could knock down big shots late in the game, is no longer an excuse as Jordan Woodard has proven more than capable. Rather, it has been the inconsistency among Woodard’s supporting cast that has caused Oklahoma’s struggles in putting together a complete performance against good competition. The 2016-17 Big 12 season is going to be an interesting one despite Kansas being the prohibitive favorite to win the conference yet again. The battle for second appears to be a three-horse race between Iowa State, Texas and West Virginia, while the middle and bottom tiers of the league will still feature teams capable of contending for NCAA Tournament bids. We’re beyond excited to see it all unfold, and with that, we unveil our Big 12 preseason predictions and superlatives (written by each voter). Drew Andrews: Monte’ Morris, Iowa State — While you could easily look at freshmen phenoms Josh Jackson and Jarrett Allen as potential Big 12 Player of the Year candidates, Monte’ Morris should win the award next March. With the departures of Cyclone stalwarts like Georges Niang, Abdel Nader and Jameel McKay, Morris will be asked to bring a huge amount of the magic to Hilton Coliseum this season. The senior will need to carry more of the scoring load in addition to his league-leading 6.9 assists per game and second-place 1.8 steals per game if Iowa State wants to make its sixth straight NCAA Tournament appearance. Justin Fedich: Josh Jackson, Kansas — Unlike last season, the pick for this year’s Big 12 Player of the Year isn’t as obvious. I’ll take the most talented player on the best team, Kansas freshman Josh Jackson. The 6’8” wing from Detroit will benefit from playing with the experienced backcourt duo of Frank Mason and Devonté Graham. He might have some early growing pains, but Kansas will need someone to replace the void left by Wayne Selden and Perry Ellis, the top two scorers from last season’s team. One Burning Question: Can Jordan Woodard Carry Oklahoma? March is sadistic. For all but one school, the month — and the few days of April we tend to group with it — inevitably ends in sorrow. For some teams like Texas or USC, that ending is abrupt, brought on by last second heroics that put an end to a once-promising season. For others, the ending is an excruciating wait. So it was for Oklahoma last season. Midway through the campaign, the Sooners were the top-ranked team in the AP poll. By the end of it, they had made the school’s first Final Four since 2002. In Houston, though, Oklahoma was steamrolled, losing to eventual national champion Villanova by the largest margin in Final Four history. With each missed three-pointer, the conclusion became clearer. It was like watching a car accident in slow motion. Now, Lon Kruger‘s team will have to rebuild its proverbial car and the model will look substantially different than last season. Gone are starters Buddy Hield, Isaiah Cousins and Ryan Spangler. The NPOY Hield, of course, will leave the biggest shoes to fill, but Cousins was a dogged defender and effective three-point shooter while Spangler was an experienced stretch four who brought a certain toughness to the team. Gone are 66.5 percent of the team’s total scoring and 59.2 percent of its total minutes played. Also gone is 7’0″ center Akolda Manyang, a potentially valuable rotation piece who was dismissed after being arrested for aggravated robbery. With so much of its Final Four roster no longer residing in Norman, Kruger will put one of his returning upperclassmen into the driver’s seat of the new model. Oklahoma isn’t a college that is historically known for basketball. That doesn’t mean that a number of outstanding basketball players and several teams haven’t passed through Norman over the years, but the Sooners are set to play in just the program’s fifth Final Four in history (the most recent was in 2002). They have twice made the national title game (1947 and 1988), but the school has never raised a championship trophy in hoops. 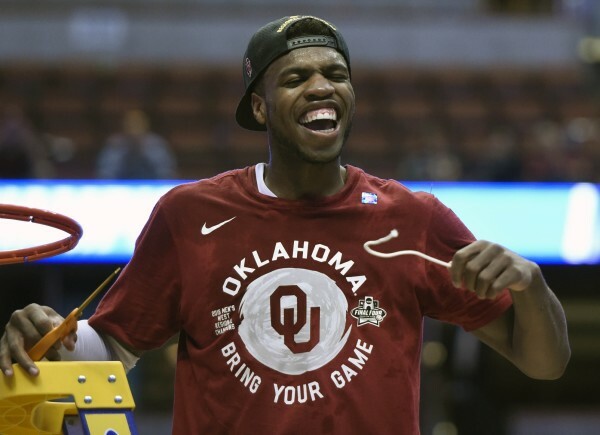 Oklahoma is much more commonly known as a football school — the only such entity in this season’s Final Four (North Carolina, Villanova and Syracuse are, without question, basketball schools) — and while the Sooners can lay claim to seven gridiron national titles, Buddy Hield is ready to challenge football’s dominance in the Sooner State this weekend. 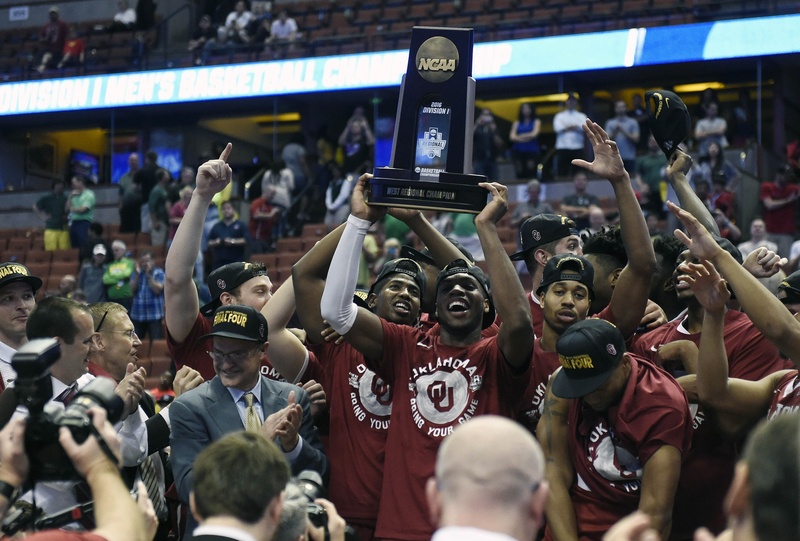 What makes this Oklahoma team the one that can cut down the nets in Houston? The short answer is Hield himself, one of the most prolific collegiate scorers in recent memory. The senior guard is the only player since 2009-10 (the first year Basketball Reference began tracking minutes played) to average more than 25.0 PPG and finish the season with a true shooting percentage higher than 65 percent. 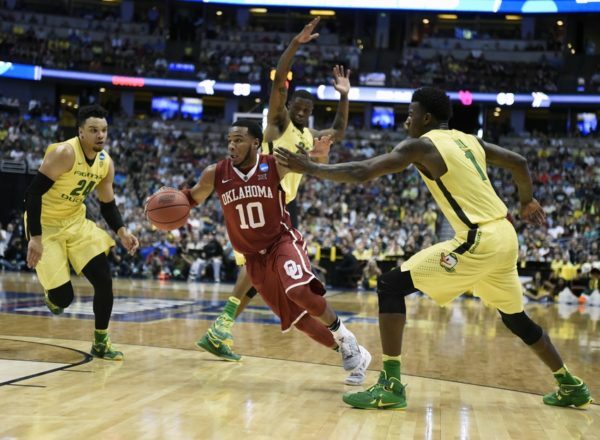 The long answer is that Oklahoma is a lot more than just the RTC National Player of the Year. The Sooners’ backcourt, comprised of Isaiah Cousins and Jordan Woodard, is one of the best in the country. Both players shoot better than 40 percent from behind the arc and can act as point guards capable of navigating Villanova’s stingy trapping defense. And contrary to popular belief, the Sooners are more than just an offensive show. Oklahoma is also stout on the defensive end where it can flexibly switch one through three on the perimeter and employ the shot-blocking prowess of Khadeem Lattin inside — whose grandfather, incidentally, played on the 1966 Texas Western team that won an NCAA championship. The last time the Sooners were national title good was in 2008-09 when future #1 pick Blake Griffin was a sophomore. Griffin’s squad lost to the eventual champion, North Carolina, in an Elite Eight game that was generally noncompetitive. This season offers the Sooners a shot at redemption. If they can make it past Villanova this evening, they’ll likely get another shot at the Tar Heels, and this time with a national title on the line. Oklahoma has already become the first school to make both the College Football Playoff and the Final Four in the same season, but Lon Kruger‘s group have a chance to surpass their football counterparts, if only for a weekend. Still, given the folk hero popularity of Hield around Norman, maybe this is the team that could help turn it into a two-sport town. We’re a little more than 24 hours from the Final Four, so it’s time to break down the upcoming games by determining what it will take for each team to win. Let’s start with the early battle between Oklahoma and Villanova, tipping off at 6:09 PM ET on Saturday evening. RTC’s Brian Goodman (Oklahoma) and Tommy Lemoine (Villanova) with the honors. It overcomes NRG Stadium’s reputation as a challenging shooting environment. Though the sample size isn’t overwhelming, teams have historically shot below their averages in the expansive confines of this year’s Final Four venue (as detailed last year by Ken Pomeroy and expanded upon earlier this week by Yahoo!‘s Jeff Eisenberg). 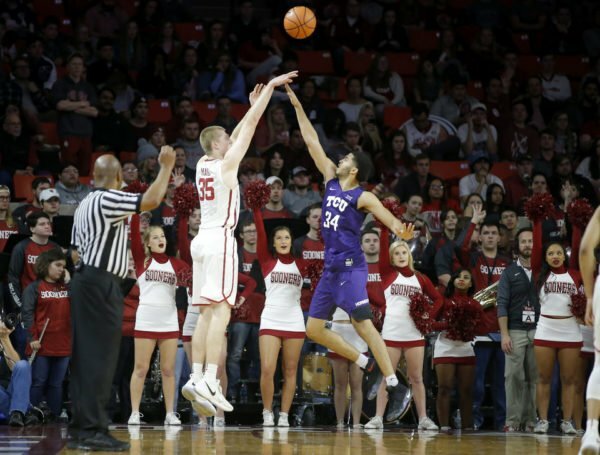 The Sooners and Wildcats are notoriously reliant on jump-shooting, but what you may not know is just how eerily similar the two teams are in this fashion. Per hoop-math.com, 67.4 percent of Villanova’s field goal attempts this season have come away from the rim, and Oklahoma is just below the Wildcats in that category at 67.2 percent. Though it’s hardly earth-shattering, sometimes these things are simple: Whichever team solves the puzzle of performing well in spite of a tougher shooting environment will prevail, and with three Sooner regulars connecting from long range at rates of 42 percent or better, Oklahoma should have the slight edge. It wins the battle of the interior. Should both teams struggle to find the range at NRG Stadium, inside play will become much more important to the outcome, and Oklahoma will have to answer some questions there. Ryan Spangler logged 10 points and eight rebounds against Texas A&M, but he hasn’t had a very good NCAA Tournament otherwise. The same can be said for rim-protector Khadeem Lattin, who went for 10 points and a pair of blocks against the Aggies, but has blocked just four shots in the Sooners’ other three tourney games. Though he’s technically a guard, freshman Christian James, a Houston native who emerged with a pair of quality outings in Anaheim, may be called upon to help inside as the Sooners look to best Daniel Ochefu and Kris Jenkins. Now that the Final Four is set, our writers have put together a fact sheet on each of the four teams still remaining. Next, Oklahoma. West Region Champions. After sleepwalking for the better part of the afternoon in their opener against Cal State Bakersfield, the Sooners found themselves down a single point with 15 minutes remaining. From there, a familiar story played out – one that would be repeated often on Oklahoma’s run to Houston: Buddy Hield took over. In the remainder of the game, Hield threw in 16 of his game-high 27 points to drag his team to the second round. From there it was a repeat performance, as Hield went off for a 29-point second half against VCU, including 22 points in the final 11 minutes after the Rams had come back from 13 down to tie the game. A Sweet Sixteen victory over Texas A&M allowed Hield to “only” go for 17 points (along with 10 boards in his sole double-double of the season) in a game that was never particularly close. But Buddy bounced back in a big way, scorching Oregon for 37 phenomenal points (including eight threes) to earn the Sooners’ first trip to the Final Four since 2002. 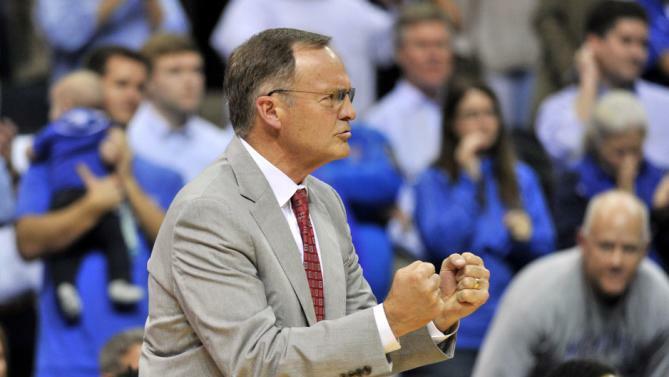 Lon Kruger. This is Kruger’s 30th season of coaching a Division I basketball program. He started at Texas-Pan American in 1982, taking the independent program to a 20-win season in his fourth year. After getting hired by Kansas State in 1986, he brought on a little-known coach named Dana Altman from Moberly Area Community College — someone who happened to have a kid named Mitch Richmond on his team. The future Hall of Famer followed Altman to Manhattan and the Wildcats subsequently went to an Elite Eight in Richmond’s senior season. A coaching star was officially born. Kansas State went to the NCAAs in all four seasons Kruger spent in Manhattan, and he turned that run into a coaching upgrade at Florida in 1990. In his fourth season with the Gators, Kruger took Andrew DeClercq, Dan Cross and Craig Brown to the 1994 Final Four, the only other time he made it to his sport’s final weekend. Since then, Kruger spent time at Illinois, the Atlanta Hawks and UNLV, before settling in Norman five seasons ago. He’s taken five Division I teams to the NCAA Tournament, four to the Sweet Sixteen, three to the Elite Eight, and now two to the Final Four. Sure, Buddy’s Great, But There’s More. Don’t worry, we’re going to get to your National Player of the Year favorite, Buddy Hield, and his 37 points, in a moment. But there is so much more to Oklahoma than just a star shooter dropping threes in from 25 feet out. This is a complete team. The Sooners have at times this year had trouble on the glass at both end of the floor. Today, the entire team chipped in to help the relatively thin frontcourt compile a significant advantage on the glass, grabbing 42 percent of the available offensive rebounds. Freshman Christian James again provided a big spark from the wing, grabbing 10 boards of his own to aid the effort. Then there’s Hield’s backcourt mates Isaiah Cousins and Jordan Woodard. They’re not as offensively explosive or as flashy as their more famous running mate, but both are highly efficient and always in control. 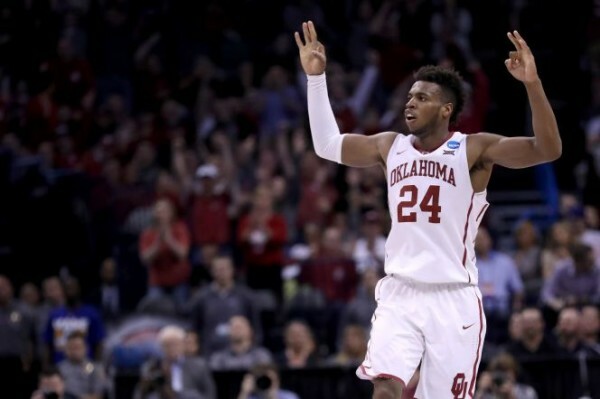 While Hield definitely has the ability to carry the team for long stretches of time, there are more reasons than he that the Sooners are Final Four-bound. Oregon First Half Out of Sorts. Oregon wasn’t going to win with Buddy Hield playing so well regardless, but the Ducks didn’t do themselves any favors either. They seemed tentative throughout the first half, always a step late to loose balls. They had at least four mindless turnovers. They left points at the free throw line. And three-point shots just weren’t falling. Some of those struggles were certainly caused by the Sooners, who pressured the Ducks at the top of the key and took ball-handlers like Casey Benson, Tyler Dorsey and Dillon Brooks out of their rhythm. But after playing fast and loose against Duke on Thursday night, the Ducks couldn’t bring the same level of energy in this one. They gave up 15 second-chance points and 12 points off turnovers, building up an 18-point halftime deficit that they never had a realistic chance to erase. Three-Point Shooting and Dunks. In the first half, the Sooners put on an offensive clinic, scoring 1.33 points per possession by hitting threes and getting easy looks at the rim. Of their 36 first half field goal attempts, 14 came from three while an equal number came at the bucket. Oregon adjusted somewaht in the second half through better energy and help defense, limiting the Sooners to just three point-blank looks in the second half. The difference was apparent in the Sooners’ production, as they dipped to just 0.97 PPP in the second half. This isn’t exactly groundbreaking news, but preventing the Sooners from getting easy looks at the rim goes a long way towards limiting their oft-prolific offense.